European Congress is open only to clubs eligible for IHRSA membership. Registration is limited to club owners and their employees. According to IHRSA guidelines, IHRSA Associate Members, Industry Suppliers and consultants are required to participate as an Event Sponsor. Please contact Lynne Devaney at lsd@ihrsa.org, to discuss sponsorship opportunities. All information collected through the registration process could be used for marketing purposes. All costs referred to are in EUR and are subject to 23% VAT. All payments must be made in EUR only. The online registration platform is a secured site. Major credit cards (American Express, VISA, and MasterCard) are accepted. Payments by bank transfer are accepted until 1 October, 2018. Payment must be received prior to the event. Delegates with outstanding payments will be asked for payment on-site or a proof of payment. If one of these cannot be supplied, the delegate will be refused permission to attend the meeting. In the event of cancellation, written notification must be sent to the IHRSA Meeting Secretariat (c/o MCI Brussels) by email IHRSAcongress@mci-group.com. All refunds will be processed and issued no later than 30 days after the meeting. In the case of government intervention or regulation, military activity, strikes or any other circumstances that make it impossible or inadvisable for the 18th Annual IHRSA European Congress to take place at the time and place provided, the participants shall waive any claim for damages or compensation except the amount paid for registration after deduction of actual expenses incurred in connection with the forum and there shall be no future liability on the part of either party. 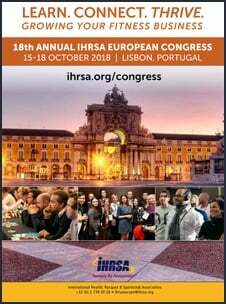 As a member, invitee, or guest of IHRSA, I intend to and will engage in physical activities and classes at the Event Venue while attending the meeting referenced above in Lisbon, Portugal, over the dates of 15 - 18 October, 2018. I assume and accept full responsibility for any and all injuries or damages that may occur to myself and any member of my family, including children, or the property of any member of my family, in or about the Event Venue forever fully release, remise, indemnify, and agree to defend and hold harmless IHRSA, the Event Venue, and ALL CONTRACTED VENDORS (hereafter referred to as the "Participating Parties"); these terms include the Participating Parties' owners, employees, agents, and assigns from any and all causes of actions, costs, damages, expenses, and liability whatsoever. By registering, I accept the terms outlined above and represent that I am in good physical condition and that I have no impairment or ailment that would prevent or make it medically unwise for me to engage in physical activities. Participants must be 18 years of age or older. Registration or attendance at, or participation in, IHRSA’s meetings and other activities constitutes an agreement by the registrant or attendee to consent to IHRSA’s use and distribution (both now and in the future) of the registrant or attendee’s image or voice in marketing materials, photographs, videotapes, electronic or digital reproductions, IHRSA website content, and audiotapes of such events and activities, and to waive any right to compensation or remuneration for the use of such images or voice recordings.